It really pays to get the kids thinking about your holiday before you head out. Giving them a foundation of information about what they’ll see gives them a foundation for learning – that will last a lifetime!! When kids have a little bit of information ahead of time it increases their curiosity! They’ll be looking for the things you discussed and actively engaged in your trip. When kids are mentally engaged, they are busy – and happy! Stop the whining! Get them interested and banish whining forever! Music, food, activities, and reading are all great ways to get kids thinking about your family adventure! Have you ever heard the saying “Music soothes the savage beast’? Well, good news! It works on kids, too. LOL! Listening to music actually changes your brain chemistry and releases the ‘feel good’ chemicals of dopamine. Music activates the parts of the brain that are involved in planning, attention and memory. That means that music will help your child remember….the feelings they have when they make memories with you on your holidays! Our brains have a separate spot just for processing music. As parents, we want to make sure we tap into every section of the brain to give our kids the best possible mental foundation. Listening to music is so easy….why not give it a try? Play music while you enjoy dinner or while you are driving the kids to school. Greek Folk Songs and Dances by Royal Greek Festival Company These are the songs you’ll hear when you watch the traditional dances. Enjoy the energy! Hercules – Animated by Disney -Rated G -Animated…Disney…what’s not to like? The music is really fun, too. Momma Mia! Rated PG 13 The movie is a cute musical but be aware that the movie is based upon the fact that an unmarried woman gave birth to a daughter who invites the three men who might be her father to her wedding. If this topic gives you pause to explain to your child then skip this one. My daughter took it all in stride (she is almost 13) but my son had a few questions about who the men were. (he is almost 11) Who knew Meryl Streep could sing? Zorba the Greek Old classic filmed in 1964. A British writer who feels his life is mundane meets a lively Greek who enjoys life to the fullest. I can’t find a rating for this. Was this in the days before the rating system? My Big Fat Greek Wedding 2 PG 13 Almost as cute as the first and definitely worth watching. I loved it. This sequel finds the main character’s daughter looking to head to college, but where? Near the family or afar? Lots of cuteness and love in this movie. I highly recommend. My favorite character is the aunt. She is a hoot! Percy Jackson and the Lightening Thief Rated PG Percy Jackson, is the son of Poseidon and a human. The Gods think he has stolen the lightening bolt from Zeus himself…but did he? Worth watching but be aware that the book is a MILLION times better!! Still great for getting the kids to visualize Greek mythology. Percy Jackson: Sea of Monsters Rated PG Fun film for thinking about Greek mythology with the kids. Read the book though also – it is sooo much better than the movie! Jason and the Argonauts Rated G This old version was filmed in 1963. This movie is about the myth of Jason, the argonaughts (a band of heroes including Hercules) and the quest for the Golden Fleece. Would be fun to watch this one and the new one and compare. Kids usually find old movies really funny because of the early ‘effects’. Worth a laugh. Jason and the Argonauts TV mini series (2 episodes) A newer version (no doubt with better effects than the 1963 version above) of the myth of Jason and his group of heroes who are in search of the Golden Fleece. Not rated but I’ve found references that suggest it is for kids ages 6+. Clash of the Titans Rated PG Interesting story about Perseus and Medusa, et al. The kids will enjoy. I personally have a hard time finding Harry Hamlin believable as a tough guy, but that’s just me. 😉 The families three children all learn to love Greece in their own way. One loves collecting animals which will especially appeal to the kids. Nothing gets a kid more interested in a topic than food! And….aren’t we all really just kids at heart? ‘Nuff said then…let’s dig in! Trying food before you visit a new place gets the kids used to something new. Once there…things are less of a shock. This might not matter to all kids, but if you have one that won’t eat green things…or won’t eat things that touch or have seeds or whatever…preparing them ahead of time can really make your life easier once you are on holiday. Bread is eaten all over the world! There are lots of different kinds and convincing a kid to try bread is usually one of the easier tasks. Tsoureki bread is eaten at Easter but available from bakeries all year round. It usually has slivered almonds on top. Traditionally it has no filling, but a major bakery in Greece, Terkenlis, started adding fillings just for fun! It has a very distinctive taste from the ground mastic or mahlab, which is made from the seeds of cherries. If you have an especially picker eater…take off the almonds first. Greek Pita bread is a lot like any other pita bread. This is a great introduction to the conversation about how people all over the world are more alike…than different. Manna Barley Rusks was a new one to me, but I just ordered some. It sounds quite crunchy like it would make a cool snack. It is made from ingredients from the island of Crete. (Super high in fiber 12.7% fiber which will help if anyone in your party has… tummy issues while traveling.) The are double baked and I’m wondering if they are really crunchy like Italian biscotti cookies which are double baked, too. Add a little flavor of Greek to some of your meals before you head off to the beautiful land of Greece! For those that love food, you’ll start thinking about vacation! For the kids who are unsure of new and different things, this will get them exposed to new things. Let’s talk about exposure for a minute. When you expose a child to a new thing – like a food, they often (especially a young child) instantly hate it. It is new. It is different. It is a weird color! How dare you suggest they eat something beside orange macaroni and cheese or orange goldfish crackers!! They hate it. But…after a tiny exposure – a small taste, a small smell, a small touch, just looking at it on the plate in front of them, will help them get used to the idea of actually trying it. Of course we all know that actually trying things leads to actually liking things! Don’t push. Remember that food is a positive part of our culture. We eat at celebrations and happy times are spent around the dinner table. They’ll come around in time. The FIRST olive trees in the whole world were grown on the island of Crete in Greece and thus, the olive oil industry there is quite old and really important to the Greek industries. Greece uses 60% of cultivated land to grow olives! Even the winners of the Olympic games were awarded an olive branch when they won at the first games in 776 BC. Greece is proud of its olives and rightly so! Many type are grown there! Trying olive oil will give you a little taste while improving your health. There are some who think part of the mystery of the healthy ‘Mediterranean Diet’ lies in the consumption of olive oil. There are such less tasty ways to be healthy, right? Iliada Organic Greek Extra Virgin Olive Oil First Cold Press NON GMO Made in Kalamata from non – GMO olives harvested by hand and then cold pressed. The Kalamata olives which make up this oil are one of the world’s most famous. Only olives that actually grow in Kalamata can have the name Kalamata…otherwise they are called Kalamon style olives. Terra Crete This is an award winning olive oil from Kolymvari Estates in the Kolymvari region in Crete. Cold extracted which is supposed to be superior than cold pressed. Described as light and fruity with hints of pear and almonds. Idyll Organic Extra Virgin Olive Oil This oil is from Koroneiki olives handpicked in Sparta, Greece. The Idyll company uses tin instead of glass for the container because it is recyclable and protects the oil from UV rays and oxidation. From a mill run by the Polymenakos family. The beautiful tin is reason enough to order this oil! Roland Olives Greek Country Mix This is a great way to try all the different olive types! When you travel to new lands, food smells different, it tastes different, it looks different! Most travelers love this and love exploring with food. Not all sightseeing is done with your eyes!! But…the youngest of travelers often have trouble with new foods. They seem suspicious actually! Have your kids every turned up their nose at something because of the color alone? Did it have….’gasp’ sprinkles of a spice visible! LOL! Give them a little exposure to what they will see and taste on your adventure to pave the way! Try using these spices on something you already cook – like beef or chicken. Konriko Authentic Greek Seasoning – This spice mixture is great on any type of meat. Greek Freak by Spiceologist I love the name. LOL! It has savory spices and orange peel powder. Sounds really wonderful. It used for BBQ. As a girl from Texas who knows BBQ, I’m anxious to try it! Simply Greek Tzazki Sauce Spice Rub Just add this spice to a Greek yogurt with 1/2 finely chopped cucumber (no seeds) for a tangy dip! Greek Oregano A little stronger than it’s cousin, Italian Oregano, you’ll love the taste of this product. I like to add it to steamed vegetables. Traditional Greek Mahlepi If you are keen on baking Greek Easter bread of sweets you’ll need this spice which comes from the pit of the Persian Cherry. Yia Yia’s Special Spices We won’t argue with Yia Yia (grandmother) about what makes the perfect special spice! What you’ll find unusual in this spice is the mint. Try it on lima beans – delicious, which says a lot about this spice because.. lima beans aren’t universally loved! Tea is really good for you! Try something special all the way from Greece while you prepare for the trip of a lifetime! Dried Sage Leaves from the Greek Mountains Ok, to be honest, I’m not a huge fan of sage…leaving it out of some of the family Italian dishes I make even. BUT, if you like sage…it sure sounds romantic that these sage leaves are “hand harvested and shadow dried in the Greek mountains”….doesn’t it? I think I need some just for that reason! It is also used to make tea and you can find some lovely information here on how to make sage tea. Loose Leaf Greek Herbal Tea by from Evenea Mountain tea is made from an herb called sidertis which is also called ironwort or shepherd’s tea. If your travels take you to the lovely GREECE you’ll want to read about it before you go! Preparing for a trip is really a part of the fun! Enjoy thinking and planning about your next family adventure. Need more tips for traveling with the kiddos? I love this! We think about books, movies and food but I’ll be honest and say I never considered music before. Such a great idea and one we will be using for our next trip! Have fun with it! Thanks for stopping by! I’m not even close to being a parent yet, but even I can see that this post is chock full of great suggestions for getting kids interested in countries and travel, and, yes, stopping them from whining hahaha! I love the suggestions you make particularly regarding movies – I have very fond memories of Mamma Mia and My Big Fat Greek Wedding. Excellent advice! You’ll be ready when the time comes for your own kids! 🙂 But until then…a lot of kids’ stuff is like Cliff Notes for grown ups!! Thanks for stopping by! Great tips in here. At least before the trip with this guide it’s way to prepare the kids before a Greece trip. Like what to expect to see, eat and see. Cool idea!. Thanks! Mine are so used to the prep now they really look forward to it. My oldest, who is almost 13 (and we all know how hard that age is to please) chirped over breakfast when I pulled out the info for the day, “Oh I love it when you have cool stuff for us!”. Such a comprehensive list for getting ready for a Greek holiday. I love how you supplemented the article with pictures of everything; it really makes the narrative easy to read. 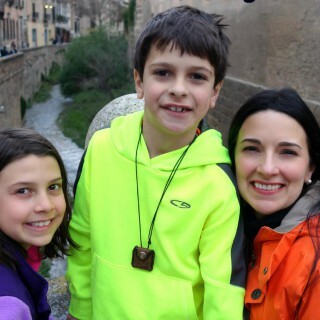 I haven’t traveled with kids in a long time but your suggestions are great, especially the books and music. Fantastic job, worthy of bookmarking for future use. Thank you! There is more to come. I have been researching traditional Greek folk dancing! Thanks for stopping by! I have never tried Greek Oregano. I didn’t even know it existed. I love the Italian oregano on almost all the Italian dishes I cook. I love Tzazki sauce also. You are inspiring me to make a yogurt dip now. They are really different, too, and it is fun to taste the difference! Enjoy!! such an interesting post! There are so many ways to get us, not just kids, excited about traveling to Greece! Music is a fun and creative way to do so! I love the getting ready part! I always learn so much! Great tips. Over the next couple years I might be traveling with kids, so this is very insightful. Thanks! Movies are great way indeed coz they have something to relate to! A great way to prepare your kids before going to a place that is new to them. By giving them like a preview of what to see and expect. As the day of the goes near they get more excited and can’t wait to check the place by themselves. Watching movies related to the place is great for kids and adults as well. Great tips on how to prepare to visit Greece with kids. It’s so true that it may take kids a little to try new foods, but I am a traveller who loves to emphasize my travels on food experiences. It’s a good idea to introduce these foods before the trip. This is a brilliant idea, not just for Greece but for anywhere different. I know my daughter is a lot happier when she’s familiar with something so all these methods of preparations would work. The food ideas take this to another level and will make eating out and buying food in the local supermarket a pleasant experience. It is a fun idea for the whole family. I’ve learned so much! First of all, it;s awesome that you travel with your kids! It brings more knowledge than any education can ever give them! I love how you put together this post and literally thought of all the details! As long as they are excited about the trip by you introducing them to things then everything should be smooth! How sweet, thank you for your kind words. Researching for a trip is so much fun. I’m learning so much in preparation for our adventure!